You would think by now I would realize that people actually read this blog. Sure, the obvious things like the comments clue me in. But, I'm still amazed and, honestly, humbled when what I've done on this little part of the interwebz reaches far beyond my own computer screen. This week I found out that my girls and I were recognized for our D-Day Art and received a Best of the 'Betes Award. Totally Cool! **Note to self, must remember to nominate awesome blogs each month for the Best of the 'Betes Awards!! 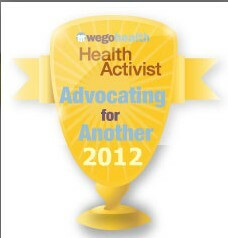 I also had an email letting me know that I have been nominated for a 2012 WEGO Health Activist Award in the category of Advocating for Another. Again, Totally Cool! This blog is my sanity sometimes. It's where I come to 'get it out' when D has me down and I just need to vent. It's where I come to share the happy moments, the smiles and laughter. It's where I come to be connected to an amazing community of other D'rents and PWDs who are my extended family. To know that what I do helps others is amazingly rewarding. It's also why I come here...to encourage others who are living the crazy D life. So, THANK YOU, THANK YOU, THANK YOU to whoever nominated me for the awards. I am so glad someone nominated your D-Art Day post. I loved the Apidra earrings. I want to know more about how you made those! You deserve this...so happy for you guys.